Set your refrigerator's temperature too high your food won't last as long as it should. Set it too cold and the compressor will run more than it has too, running up your electric bill. How do you know if it's too cold or too warm? This thermometer will take the guesswork out of setting the temperature control, and most likely result in lower electric bills. It has a toxic-free filling and a shatterproof clear plastic lens. 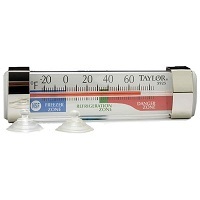 The thermometer is designed to either hang out of the way from an internal rack or stick to an inside wall with suction cups. It will measure from minus 40 degrees Fahrenheit to over 60 degrees Fahrenheit. The temperature scale has markings clearly indicating what the recommended temperature ought to be for both the refrigerator and the freezer compartments.